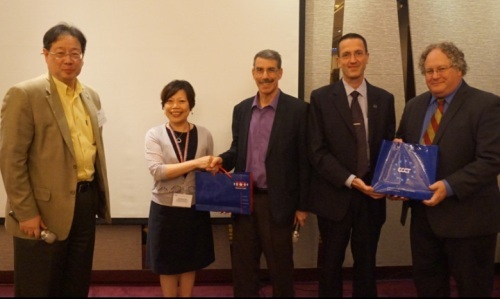 On 11 May the ECCT's Greater China committee jointly hosted an event with AmCham Taipei and the Rotary Club of Taipei featuring a documentary film, speech and Q&A session with guest speaker Mike Chinoy, Senior Fellow of the US China Institute, University of Southern California. The documentary film is the last in a 12-part documentary series chronicling the history of American correspondents in China from the 1940s to the present day produced by the US-China Institute at the University of Southern California. Chinoy, a former CNN Beijing bureau chief and Senior Asia Correspondent, was the lead reporter. Previous films in the series included back stories on US President Richard Nixon's first visit to China and the Tiananmen square incident. The latest film tells the story of how two American news organizations uncovered and eventually published details about the hidden fortunes accumulated by the relatives of senior Chinese leaders. The film covers the controversies, threats, and intimidation of the Western media leading up to and following the publications, a pattern which continues in China today. The film shows how the correspondents benefited from China's evolution towards a more open, internationally engaged, market-style economy to unravel a series of complex, opaque, often hidden business dealings of the elite. The behind-the-scenes story of the journalists who conducted the investigations and who faced the dramatic, controversial and often frightening consequences is based on extensive interviews with most of the leading figures involved. The film chronicles the emergence of a new kind of investigative journalism that is emerging in an effort to understand the dynamics of a new, wealthy, and increasingly powerful China. In the Q&A session Chinoy emphasized the difficulty and enormous amount of work that goes into investigating these kinds of cases. Given the shortage of resources of Western media organisations operating in China, it is clear that journalists have only just begun to scratch the surface.